A month ago, I happened upon a post about 20th Century composer Alfred Schnittke (1934-1998), described by critic Alex Ross as a "connoisseur of chaos" who "represents not only a moment in the history of Russia, but also a moment in the history of music." In his too-brief lifetime, Schnittke wrote scores for more than five dozen films, symphonies, operas, concerti, string quartets, sonatas, and much more. He is among the most renowned of Soviet modern music masters and lauded for his "polystylism", that is, the use of multiple contrasting styles or techniques in the same composition. In looking over his output, I learned that the highly prolific Schnittke composed an oratorio, Nagasaki (listen to the first and second movements in the audio below), in 1958, when he was only 24 years old! An extraordinary subject! Written for mezzo soprano, mixed choir, and large orchestra, the oratorio comprises five movements: "Nagasaki, City of Grief", "The Morning", "On That Fateful Day", "On the Ashes", and "The Sun of Peace". Broadcast on Moscow World Service Radio in 1959, the oratorio did not receive another public performance until 2006, at South Africa's inaugural Cape Town International Summer Music Festival. More recently, it was one of the selections for the American Symphony Orchestra's December 10, 2014, program, "Requiem for the 20th Century". The ASO's notes indicate that Schnittke's composition draws on "three poems by Russian and Japanese authors, and was influenced by composers ranging from Shostakovich and Prokofiev to Bach, Stravinsky, and even Carl Orff". For more information about the work, read the ASO's brief program notes or Calum MacDonald's more detailed program notes. Listen to other works, including a cello concerto, cello sonata, piano quintet, string trio, and orchestral piece. This poem was crafted from individual words found in a TweetSpeak Poetry post titled "Top 10 Poetic Tweets". Monday Muse is closing out 2014 with a little light entertainment: History's quick review of New Year fun facts, which covers everything from date-setting on ancient calendars, to celebrations with special foods, to marking the stroke of midnight with fireworks or a pickle* or possum** drop. Enjoy! Somehow I missed 2011 (because, as I recall now, I was working the final text for Neruda's Memoirs imminent release); however, I did manage to write a villanelle. to understanding who we are. . . .
Berlin-born Charlotte Salomon (1917-1943) was a Jewish artist who made hundreds upon hundreds of paintings, which were found sometime after World War II in a cellar in the south of France, where Salomon was living with her grandparents in exile from Nazi Germany in the years 1939-1943. In 1943, she was deported with her husband, Alexander Nagler, to Drancy, and then to Auschwitz, where she was gassed. She was 26 and five months pregnant. Nagler became a forced laborer and survived until 1944. Her parents lived in hiding in The Netherlands and survived the Holocaust. Salomon's paintings, integrated with texts, were her visual autobiography, which she titled Life? Or Theatre? A tri color Operetta, and subtitled A Play With Music. The story about the creation of the paintings is the subject of the film Death & the Maiden, by Israeli filmmaker Yael Lotem. The film, which received a second prize award at DocAviv Festival 2014, was shown at the DOC NYC Film Festival in November. Unfortunately, the documentary's trailer is available on Vimeo only to those with a password. Earlier, it had been public. Additional information about Charlotte Salomon and her profoundly tragic life, as well as her work, is found in The International School for Holocaust Studies, Yad Vashem; the Jewish Historical Museum, The Jewish Museum, which exhibited the paintings in 2001; and Jewish Women's Archive. ✦ Ceramic artist Anna Metcalfe's "Mississippi River Story Boats" is an inspired collaborative project. Virginia-born, Metcalfe has lived in Minneapolis since 2006. In addition to teaching at Springboard for the Arts, St. Paul, Metcalfe is one of the artists responsible for Gather, now in its preview stage and slated to become for engaged couples an online art registry/gallery of hand-made items by artists local to the Twin Cities and greater Minnesota. ✦ Corning Museum of Glass will be opening its new Contemporary Glass Galleries on March 20, 2015. The space will be used for special temporary projects, including large installations. First up: Kiki Smith's room-size Constellation, a recent acquisition. ✦ Palestinian American artist Manal Deeb's Memories of Trees is a beautiful series in tree bark. Her work Invitation was most recently in ARC Gallery's "The 'F' Word: Feminism Now", a juried exhibition, in Chicago. ✦ These days, as he has been since 1979, Joe Cunningham can be found sewing quilts, by both hand and machine. In addition to giving lectures and workshops, the former music-maker is the subject of a feature article, "Crazy Quilts", in the December/January 2015 issue of American Craft Council's American Craft. ✦ Sculptor Bernardi Roig's "No/Escape" is featured in the current Intersections series at The Phillips Collection. Roig's work, on view through March 8, 2015, can be seen in this video. Body art from around the world is spotlighted in The Human Canvas (Impact, December 2014), by Karala Barendregt. ✭ Continuing through January 25, 2015, is "Jesse Walp: Ripe" at Burchfield Penney Art Center at SUNY Buffalo State. On view are the furniture designer Walp's fantastically shaped organic forms in wood. Among the woods that Walp uses: poplar, cherry, walnut, white oak, and basswood. Gorgeous work! ✭ The solo exhibition "Giovanna Cecchetti: The Consciousness of Infinite Goodness" continues through January 4, 2015, at Hunterdon Art Museum, Clinton, New Jersey. The exhibition features Cecchetti's beautiful abstract paintings and works on paper, which were inspired by a trip to the Amazon and the artist's introduction, through a medicine man, to the Hindu deity Siva. Read Cecchetti's interview about the inspiration for her exhibition and her painting techniques: Part 1 and Part 2. ✭ More than 200 rare pieces are on view in "Artist Textiles: Picasso to Warhol" at the American Textile History Museum, Lowell, Massachusetts. Continuing through March 29, 2015, this major exhibition, organized by London's Fashion and Textile Museum, presents textiles by Georges Braque, Alexander Calder, Marc Chagall, Sonia Delaunay, Barbara Hepworth, Fernand Leger, Henri Matisse, Henry Moore, Pablo Picasso, and others, effectively tracing the history of textile art in the 20th Century. In addition to work from leading fashion designers and manufacturers, the show offers examples from European and American art movements, including Cubism, Abstraction, Surrealism, and Pop Art. 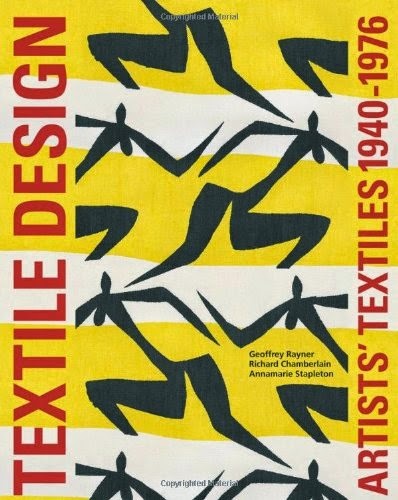 Artists' Textiles 1940-1976 accompanies the exhibition. The book is by exhibition curators Geoffrey Rayner and Richard Chamberlain. ✭ California's San Jose Museum of Quilts & Textiles continues through March 1, 2015, its exhibition "Antique Ohio Amish Quilts from the Darwin D. Bearley Collection". More than three dozen bed, crib, and doll quilts, all made between 1880 and 1940, are on view. Another show, "Two Color Wonders", features a selection of 19th Century and early 20th Century quilts and woven coverlets from the museum's permanent collection. That exhibition, too, runs through March 1. Read more about the Amish quilt show and Bearley in the museum's Fall 2014 News (pdf). ✭ Save the Date! Opening January 16 at New York City's Drawing Center: "Tomi Ungerer: All in One", the first career retrospective in the United States dedicated to the French author and illustrator Tomi Ungerer. In addition to Ungerer's childhood drawings on the Nazi invasion of Strasbourg, the exhibition will present the artist's work during his time in New York and Canada and his political and satirical advertising campaigns. 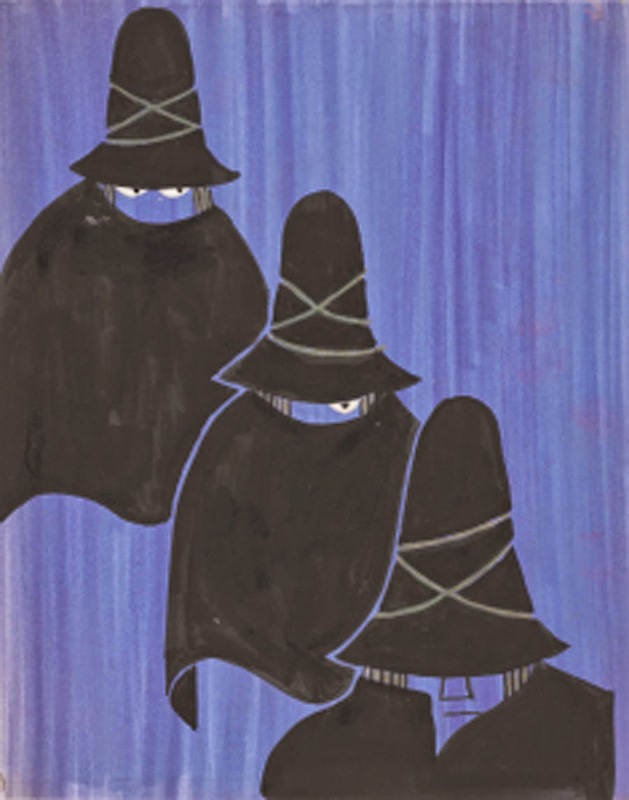 Also on view will be the illustrations for Fog Island (2013), Ungerer's children's book. The exhibition, which will continue through March 22, 2015, will occupy the entire Drawing Center. An illustrated catalogue will accompany the exhibition: Tomi Ungerer: All in One (Drawing Papers Series/Phaidon Publishing) will contain essays by Drawing Center curator Claire Gilman as well as Therese Willer, curator of Tomi Ungerer Museum in Strasbourg; a homage by children's book author and illustrator Peter Sis, an autobiographical statement about drawing by Ungerer, and a comprehensive chronology. find warmth, good cheer, and especially each other's abiding love. up doing what you must do, what you're driven to do. . . . In October, Jerry Saltz, senior art critic for New York magazine, presented a talk as part of the Smithsonian American Art Museum's annual Clarice Smith Distinguished Lectures in American Art, an annual speaker series. The lecture, originally streamed live, is below. Titled "A Year in the Life of an Art Critic: The Good, the Bad, and the Very Bad", the hour-and-a-half talk ranges from Saltz's perspectives on his job, to what other artists teach us about art, to "essential rules" for artists, which include Saltz's admonition to "not ever be defined by rejection or failure, ever." Saltz, formerly senior art critic for Village Voice, has published two volumes of criticism (Seeing Out Loud: The Voice Art Columns Fall 1998 - Winter 2003 and Seeing Out Louder: Art Criticism 2003-2009) and twice was a finalist for the Pulitzer Prize in criticism. Winner in 2007 of the Frank Jewett Mather Award in Art Critcism (College Art Association), Saltz lectures throughout the United States and has taught at a number of educational institutions, including Yale and Columbia and The School of the Art Institute of Chicago. The other 2014 SAAM speakers were artist Eric Fischl (September) and Kathleen Foster (November). Fischl's talk is titled "On and Off the Canvas"; Foster's is titled "They're Saved! They're Saved! Winslow Homer and the Life Line." Me Warm. Fa La La. the Same Old Lang Syne. All of the above use titles of holiday songs and as few other words as possible. Also see: "Holly, Ivy, Mistletoe", December 3, 2013; "Monday Muse Writes Holiday Haiku", December 3, 2012; "Monday Muse Writes to Dear Santa", December 10, 2012; "Christmas Listening Posts", December 23, 2010; and "With the Berryville Monks on Christmas Eve", December 21, 2010. 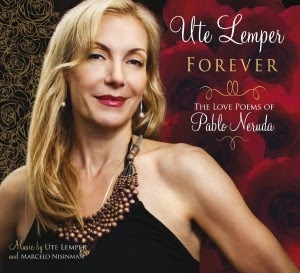 The 6:14-minute video below is an introduction to a wonderful self-produced album Ute Lemper Sings the Love Poems of Pablo Neruda (December 2013). The German-born, internationally renowned chanteuse sings 12 of Neruda's poems, remaining faithful to their original form. Though Lemper sings primarily in the original Spanish, she uses official adaptations in French or English for four poems; she did so, she indicates, to "make the project more international" in light of the many languages into which Neruda's work has been translated. The artistic concept is Lemper's own, and the result, to this listener's ears, is inspired! The gates of paradise have rusty hinges. Today's short is the trailer for the 16-minute documentary Cast in India, from producer-director Natasha Raheja of Brooklyn, New York. The film, which was part of the DOC NYC Film Festival in November, looks at the lives of workers in Howrah, India, who forge the manhole covers found on New York City streets. The film is in Bengali and Hindi, with English subtitles. The trailer also is on Vimeo. ✦ Neuroscientist Greg Dunn is also a painter, and his work reflects his passions for both science and art. In the video below, Dunn explains how he makes microetchings (hand-made lithographs in which light is manipulated microscopically to control reflectivity on metallic surfaces). He developed microetching techniques with his colleague Dr. Brian Edwards. Don't miss Dunn's gold leaf works and scrolls. Dunn's prints (giclees) are beautiful, too. ✦ Free blown and worked glass by Alexander Fekete assumes exquisite proportions. Also see his work here, here, and here. Fekete recently exhibited at SOFAexpo in Chicago. ✦ Japanese glass blower Hiroshi Yamano uses traditional motifs in new ways, employing silver leaf engraving and copper electroplating to gorgeous sculptural effect. Examples of his work include Zen Gardens in Glass, Fish on the Stone, and East to West Miniatures. Also see Yamano's page at Art Glass. ✦ Drawing inspiration from nature, Laura Kramer creates beautiful one-of-a-kind decorative objects made from dried wasp combs and handmade glass. Baronet, designated of the "100 Dallas Creatives", is a professor and life/business coach. His art project has received much well-deserved praise. Baronet's blog is We are all homeless. ✭ A participatory exhibition at The Aldrich Contemporary Art Museum, Ridgefield, Connecticut, features the conceptual "Six Story Gathering Boxes (1972-2014)" of Mary Beth Edelson. Several of the boxes encompass texts on themes such as gender, sexuality, myths, goddesses, and spirituality; others have paper tablets on which questions have been stamped to prompt viewers' hand-written responses. Of four boxes with paper tablets, one, Family Immigration Stories, is a new work created for the exhibition and eliciting viewers' contributions. The artist performs the role of archivist, curator, and caretaker of the boxes. A fuller explanation of the use of the boxes as time capsules of cultural perspectives is at the exhibition link above and in this pamphlet. The exhibition continue through April 5, 2015. ✭ Florida's Boca Raton Museum of Art is presenting realist and expressionist work by Theresa Bernstein (1890-2002), an American who exhibited in every decade of the 20th Century. Her paintings encompassing such subjects as women's suffrage, immigrants, World War I, racial discrimination, and unemployment and portraits of Albert Einstein, Martha Graham, and others, are featured with interviews and related memorabilia. The show, which began at the James Gallery in the Graduate Center, City University of New York, is on view through January 11, 2015. Oil on Canvas, 40 " x 50 "
✭ Embroidered tapestries by Liz Whitney Quisgard can be seen in "VIVID" through January 18, 2015, at Arkansas's Fort Smith Regional Art Museum. Quisgard, of New York City and a painter for more than six decades, describes her extremely detailed and structured designs as "pseudo-pointillism". The beautiful works in the show are inspired by Moorish architecture, Navajo textiles, Byzantine mosaics, and the Baroque. ✭ Thirty original paintings by Grandma Moses (Anna Mary Robertson, 1860-1961) are on view at Huntsville Museum of Art in Alabama through March 1, 2015. Presenting works on loan from the National Museum of Women in the Arts, Phoenix Art Museum, and other art institutions in the United States, the exhibition is co-curated by Galerie St. Etienne, New York City, which represents the Grandma Moses Estate. On February 22, 2015, Galerie St. Etienne's co-director Jane Kallir will give a lecture, "Grandma Moses: Her Art and Life", beginning at 1:00 p.m. Kallir is an expert on Grandma Moses's works. ✭ Ongoing at Paris Gibson Square Museum of Art, Great Falls, Montana, is "Jean Price: Three Thousand and Counting", a commemoration to American soldiers who fought and died in the Iraq War. Local artist Jean L. Price created the memorial installation to honor each soldier who lost his or her life in Iraq. The mixed-media memorial, comprising for each Armed Services member killed a dog tag made from aluminum tooling foil and providing name, rank, and age, was rededicated in 2007. Montana soldiers are represented with copper and brass dog tags. Read the online brochure, which includes images. Today, I can be found at Escape Into Life arts magazine, where I've posted my latest Artist Watch feature on encaustic photographer Clare O'Neill. Minnesota-based, Clare O'Neill comes to photography by way of a small business she started that offered custom tours of Ireland; while creating the promotional materials for her business, she discovered she had a natural eye and considerable talent for photography. Her strong sense of creative possibility led her to experiment with printing on tissue paper and layering molten beeswax and pigments. The unique, transformative results, as the Artist Watch feature shows, are playful, fluid, and three-dimensional in effect. All the mixed-media images at EIL, including the image above, were taken underwater and are from O'Neill's ongoing and aptly named series Below the Surface. (Additional examples of her work, which are available as originals and fine art prints, may be seen at her Website.) An Artist Statement and brief biography complement the feature. 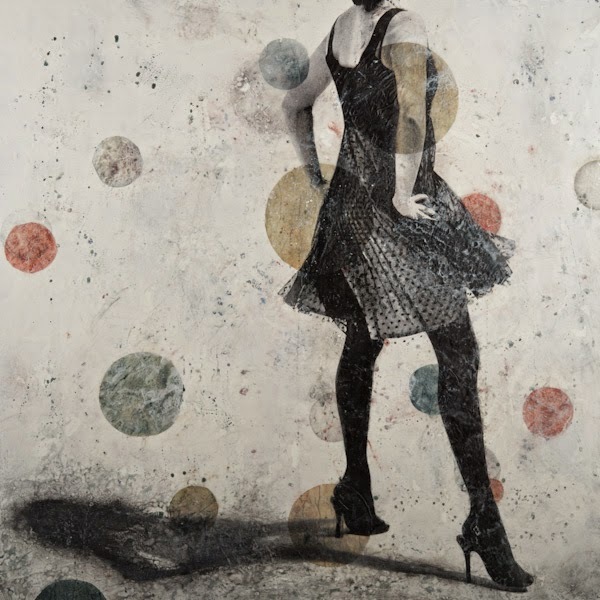 O'Neill offers one-on-one mentorships and teaches the art of photo encaustics. Consult her teaching Website for details; her new five-week online course begins January 12, 2015. Peter Dahmen of Germany engineers paper. Watch this award-winning wonder as he sculpts paper into remarkable pop-up creations. 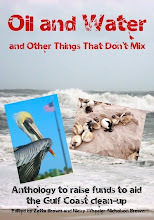 This is an ekphrastic poem in response to a photo poetry prompt from Darlene Countrygirl. Monday Muse promised an occasional update of her reading of writing by women, because this has been the "Year of Reading Women" for which the hashtag #readwomen2014 was created. Today's post highlights my ongoing recommendations of collections of poetry or poetry-related resources; memoir, autobiography, and biography; and fiction and nonfiction that I have read this year. I have read all of the titles, some of which contain gorgeous writing, since my initial post in March. in waiting, does it begin to lessen? Today's short is the beautiful "Meditation" from the opera Thais by Jules Massenet. It is performed by violinist Joshua Bell, who, in mid-November, performed with the New York Philharmonic. For comparison, listen to Itzhak Perlman's performance of the same piece in 2012. 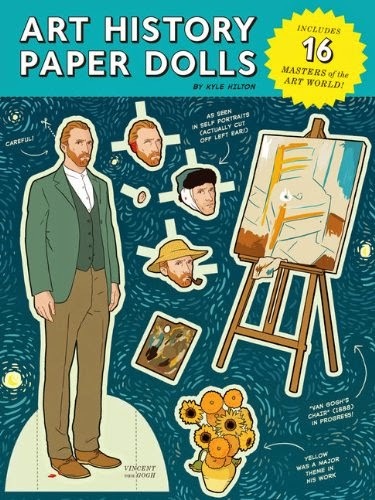 ✦ This Christmas you might want to consider Art History Paper Dolls (Chronicle Books, August 2014) for all the emerging artists or art students on your gift lists. Created by illustrator Kyle Hilton, the stocking stuffer features stand-up art world masters: Leonardo da Vinci, Michelangelo, Vincent van Gogh, Rembrandt, Edgar Degas, Salvador Dali, Henri Matisse, Paul Cezanne, Claude Monet, Henri de Toulouse-Lautrec, Marcel Duchamp Pablo Picasso, Roy Lichtenstein, Jackson Pollock, M.C. Escher—and, in a bow to women, Georgia O'Keeffe. There also are more than 100 "props" for an interactive experience. Some examples: Toulouse-Lautrec appears with his own Parisian nightlife, Dali with a surreal lobster telephone, van Gogh with an impressionistic bouquet of sunflowers and that famous severed ear. The challenge will be to keep the play art-historically accurate, or not! ✦ Sculptor and installation artist Novie Trump, who formerly was executive director of Lee Arts Center, Arlington, Virginia, and founder and director of Flux Studios in Maryland, where I first saw her work, can now be found in Jerome, Arizona. Flux Studios itself has moved with Trump to a new home in Jerome, where it features contemporary fine art and craft and participates in the First Saturday Art Walk. Our area misses both. Trump is a terrific artist. ✦ Ontario-born Ellen Jewett, who also is a professional animal trainer, creates otherworldly mixed-media sculptures that encompass an assortment of creatures and beasts of burden. They're astonishing narratives individually and collectively. Jewett's work can be found at her Etsy Shop. The museum's exhibition "Calder and Abstraction: From Avant Garde to Iconic", continues through January 4, 2015. A quick exhibition overview is provided view this video. ✭ Baltimore's American Visionary Art Museum is showing through August 30, 2015, "The Visionary Experience: Saint Francis to Finster". Among highlights are a centennial celebration of the work of Rev. Howard Finster, the late Ingo Swann's huge and out-of-this-world paintings, Terrence Howard's sculptures, and cosmic works of polymath Walter Russell, plus peeks into the spiritual life of Jimi Hendrix. An incredible show! 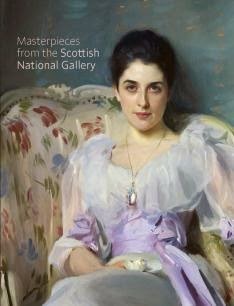 ✭ Paintings from the 15th to 19th centuries, including Botticelli's The Virgin Adoring the Sleeping Christ Child (exhibited for the first time in the United States) and John Singer Sargent's Lady Agnew of Lachnaw, are featured in "Masterpieces from the Scottish National Gallery", on view through February 1, 2015, at The Frick Collection, New York City. Lectures and other related programs are scheduled throughout the exhibition's run. A catalogue with 53 color illustrations accompanies the show. 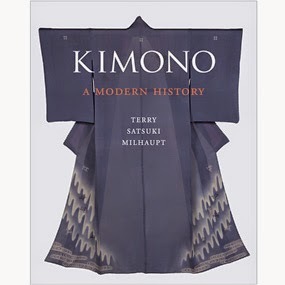 ✭ Also in New York City, The Metropolitan Museum's "Kimono: A Modern History", on view through January 19, 2015. The exhibition showcases gorgeous examples of kimono from as early as the Edo period (1615-1868). More than 50 Japanese garments are on display, including not only those custom-made for the wealthy but pieces made for the public. Three contemporary kimono created by designers whom the Japanese government has designated as "Living National Treasures" are featured. A 140-illustration catalogue on the design, function, and meaning of kimono accompany the exhibition (see images at the exhibition link). Tonight the Met Museum is presenting a gallery event, "Get Wrapped Up: Poetry and the Art of the Kimono" beginning at 6:30 p.m.
✭ The National Building Museum, Washington, D.C., continues "The Architectural Image, 1920-1950: Prints, Drawings, and Paintings from a Private Collection" through May 3, 2015. Featured are 70 prints, original drawings, and paintings by artists such as Howard Cook (1901-1980), Mark Freeman (1908-2003), Gene Kloss (1903-1996), Louis Lozowick (1892-1973), Charles Turzak (1899-1986), and Grant Wood (1892-1942). ✭ London's Dulwich Picture Gallery has mounted an exhibition of work by "Canada's van Gogh", Emily Carr. 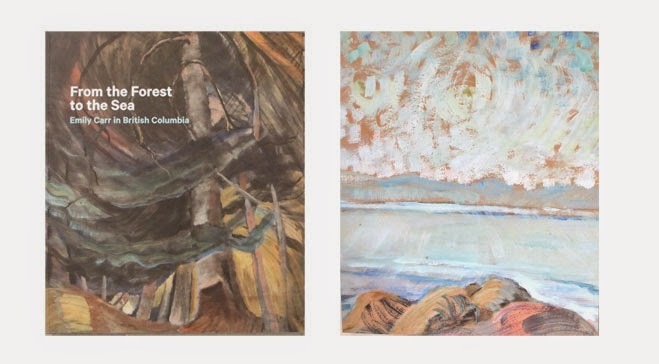 Titled "From the Forest to the Sea: Emily Carr in British Columbia", the exhibition, continuing through March 8, 2015, is the first in the United Kingdom dedicated to Carr. In addition to a display of Carr's forest scenes and of her sky paintings, beach scenes, and landscapes, the show offers a look at Carr's small watercolors, drawings, sketchbooks, and writings, and includes archival photography. A catalogue accompanies the exhibition (image below). Visit the Emily Carr Website at Vancouver Gallery. You'll find there images of a selection of Carr's works, a biography, and various educational resources. Additional information is found on the Vancouver Gallery page and the National Gallery of Canada page for Carr. Also see the Art History Archive. The Guardian offers a selection of Carr's paintings ("Emily Carr at Dulwich Picture Gallery - In Pictures") and an exhibition review. Today's Thursday's Three offers a trio of recently published art books you might want to add to your bookshelves or give as gifts. ✭ Published by Harvard University Press, The Image of the Black in Western Art is a series of redesigned and new large-format, color editions issued with the collaboration of the W.E.B. Du Bois Institute for African and African American Research at the Hutchins Center at Harvard. The original five volumes were produced 50 years ago as part of a research project and photo archive supported by art patron Dominque de Menil. Five more volumes have been added. The volume in the image below, edited by art historian David Bindman of University College London and Harvard professor Henry Louis Gates, Jr., was issued in October 2014; it is the final volume. Details and ordering information for all the volumes, which include scholarly essays, are found in the Volumes section of a Website dedicated to the series. This is an extraordinary and important compilation. Below is a video in which Gates explains the project's history. 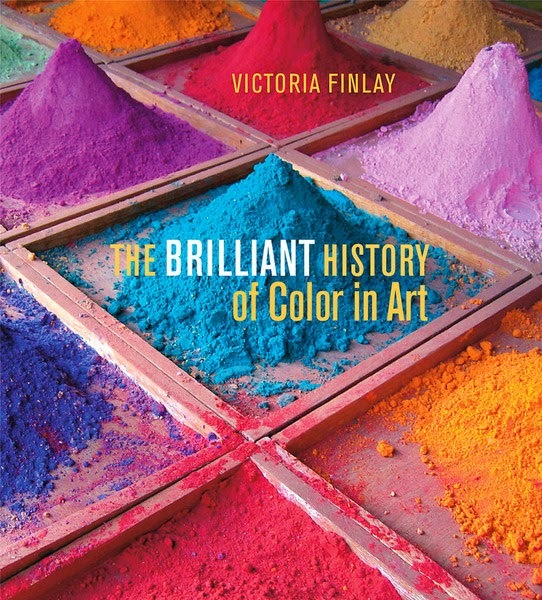 ✭ Writer and journalist Victoria Finlay's The Brilliant History of Color in Art (J. Paul Getty Museum, November 1 2014) tours the world and time-travels as it seeks to uncover the origins and science of color. In addition to a trove of facts and anecdotes, the book features some 166 full-color illustrations of major artworks. Its tone is conversational and its narrative fascinating. Finlay's also the author of Color: A Natural History of the Palette (Random House, 2003) and Colour: Travels Through the Paintbox (Sceptre, 2003), as well as Jewels: A Secret History (Random House, 2007). These and her other books are described at her Website. Read Finlay's interesting post for the museum's blog, The Getty Iris, "My Lifelong Quest for Color". 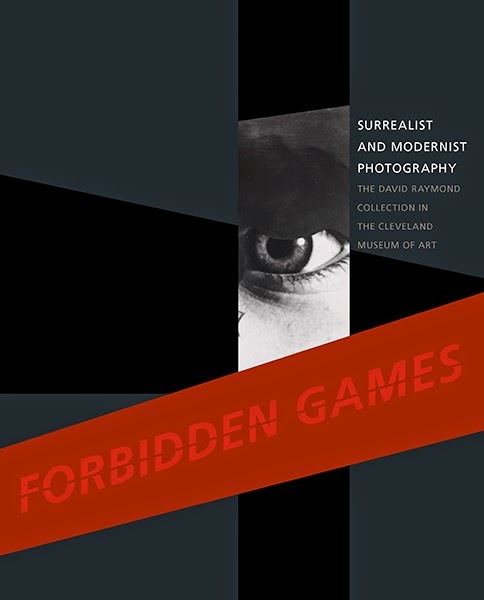 ✭ Images of 178 vintage prints from the 1920s through 1940s are showcased in Forbidden Games: Surrealist and Modernist Photography: The David Raymond Collection in the Cleveland Museum of Art (Yale University Press, October 28, 2014). The collection is a recent acquisition of the Cleveland Museum. This book includes work by artists from 14 countries; among the most well-known artists featured are Brassai, Laszlo Moholy-Nagy, Dora Maar, and Man Ray. Tom E. Hinson, Ian Walker, and Lisa Kurzner contribute scholarly essays encompassing the history, techniques, and symbolism of the photographs. The book accompanies an exhibition at the Cleveland Museum of Art that continues through January 11, 2015. Read the museum's blog post, "Forbidden Games: Take a Peek with the Eye in Its Wild State", about the exhibition and the collection. A short taken from the record Years is today's Wednesday Wonder. Created by Bartholomaus Traubeck, the record takes as its source sounds that have been "translated" from the rings of a variety of Austrian trees. The digital release is a MP3. This is an ekphrastic poem. Its inspiration is a photograph by Darlene Countrygirl at SimplyDarlene. One of the meanings of "shiver" is "to shatter". and West of my future. Poetry, to be poetry, need not be reduced to writing on a page, as I think today's beautiful short, The Nightingale (2003), by Grace Ndiritu, shows. Featuring Ndiritu, the seven-minute film (its title evocative of the famous tale of unrequited love) presents a sequence of transformative movements, each altering the artist's physical appearance and, therefore, cultural identity. Garbed in a fabric that she turns at first slowly and then rapidly, in rhythm to the African music, her eyes fixed on the viewer, Ndiritu reveals herself blindfolded and then in headscarf, burka, veil, bandanna, purdah, gag, and turban. With each dramatic change of reference, she challenges us to acknowledge and examine our perceptions and stereotypes, until the moment of the final visual metaphor — birds in flight — comes onscreen, revealing to us the possibility that we can free ourselves from what prevents us from being wholly human. While made more than 10 years ago, this video remains profoundly relevant. from those who lack power: their dignity. THE NIGHTINGALE (2003) from GRACE NDIRITU on Vimeo. Grace Ndiritu lives and works in London. She has made more than 40 "hand-crafted videos" and "video paintings", including A Week in the News (2010) and Arrested Development (2003). Her work is the collections of the Metropolitan Museum of Art and in private collections in the United States and abroad. Today brings more than a single short, because the two excerpts that follow are delightful. The first, the trailer for Tant de Forets, is based on a poem by French screenwriter and poet Jacques Prevert (1900-1977); it premiered on French television earlier this year. The second short is Orman, comprising several scenes of nature, the first leading to the next. Both are co-produced by French illustrators-animators Burcu Sakur and Geoffrey Godet. ✦ Geologist and visual artist Anna Kaye, whose work is found in private, corporate, museum, and international collections worldwide, draws deep inspiration from nature; most recently, she has been creating stunning and meticulous works on paper with charcoal, graphite, colored pencil, and watercolor (see images and descriptions 2011-2013). Her trompe l'oeil oil paintings of broken glass from her Vitreous series are spectacular, as are her Shallow Water oils and 3-D paintings titled Inside Out. Take a look at her time-lapse videos of areas originally destroyed by fire and now coming to life. ✦ The Norman Rockwell Museum has digitized approximately 50,000 images from the Norman Rockwell Photographic Print Collection. The black-and-white photographs are found on the museum's Website under "View the Collections". Read "Norman Rockwell Photographs Now Accessible to the Public and Researchers for the First Time". ✦ To mark the 400th anniversary of the death of El Greco (1541-1614), the Embassy of Greece and SPAIN Arts & Culture presented in October the exclusive premiere of El Greco: An Artist's Odyssey, a documentary, with filmmaker Carroll Moore of the National Gallery of Art, Washington, D.C. Currently, the NGA is showing the 30-minute film in conjunction with its exhibition "El Greco in the National Gallery of Art and Washington-Area Collections: A 400th Anniversary Celebration", which continues through February 16, 2015. The NGA owns seven paintings by El Greco; its exhibition showcases 11 paintings, including several from Dumbarton Oaks, The Phillips Collection, and The Walters Art Museum. Related anniversary exhibition are taking place through February 1 in New York City, at The Frick Collection and the Metropolitan Museum of Art (including works on loan from the Hispanic Society of America). ✦ Visual storyteller Orly Avineri, whose work I first encountered through my friend Seth Apter (see Seth's The Pulse of Mixed Media), teaches art making and visual journaling; she describes herself as "an avid collector of words, memories, sights, colorful people, experiences and more." 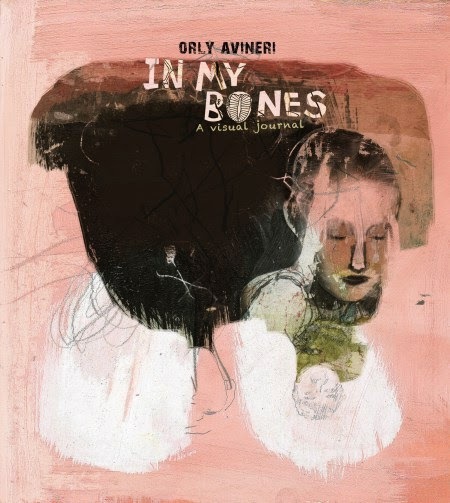 The author of One Artist Journal and 14 Artist Journals, Avineri most recently published In My Bones: A Visual Journal. (The books also are available through Amazon.) Visit Avineri's blog, where she generously shares her art and includes information about her workshops and retreats. Her mixed-media imagery is terrific. ✭ Smithsonian American Art Museum, Washington, D.C., features 46 works by 12 contemporary artists in "The Singing and the Silence: Birds in Contemporary Art". A highlight is James Prosek's temporary, site-specific mural, What once was is no more: Passing like a thought, flight into memory (see time-lapse video of installation below), which depicts now-extinct passenger pigeons making their way though American chestnut trees, also largely absent now from the eastern United States. Some other artists whose work is included are David Beck, Rachel Berwick, Lorna Bieber, Barbara Bosworth, Petah Coyne, Walton Ford, and Fred Tomaselli. The exhibit, which continues through February 22, 2015, corresponds with two notable anniversaries: the extinction in 1914 of the passenger pigeon and the enactment of the Wilderness Act in 1964. 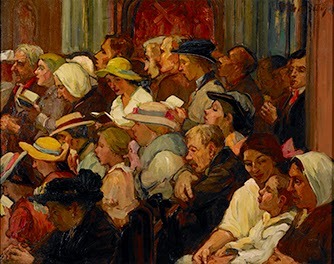 View a selection of the exhibited work in this online gallery. 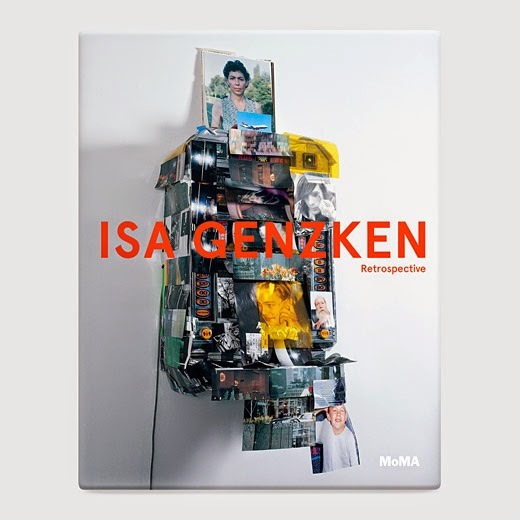 ✭ A comprehensive retrospective exhibition of the work of Isa Genzken continues through January 4, 2015, at Dallas Museum of Art. Nearly 200 works, many on view for the first time in the United States, are included in the show, which features pieces in all media created over the last 40 years, from paintings, photographs, drawings, and collages, to artist books, film, and three-dimensional work. A catalogue with 320 illustrations accompanies the exhibition. Dallas brings the traveling exhibition to its conclusion; the retrospective opened at the Museum of Modern Art in New York City (read Ulrike Knofel's article "MoMA Retrospective: The Strange Brilliance of Isa Genzken" at Speigel Online International and Peter Schjeldahl's "Views from the Edge" for The New Yorker) and then went on view at the Museum of Contemporary Art Chicago. ✭ On view for the first time at Baltimore Museum of Art are 26 narrative prints that address social issues through myths, folk lore, religious stories, and fairy tales. The exhibition "On Paper: Alternate Realities", continuing through April 12, 2015, features two complete portfolios by Raymond Pettibon and Trenton Doyle Hancock and new acquisitions of work by Wangechi Mutu, Amy Cutler, Chitra Ganesh, Toshio Sasaki, Iona Rozeal Brown, and William Villalongo. The centerpiece is Enrique Chagoya's eight-panel, accordion-bound work titled El Regreso del Canibal Macrobiotico (The Return of the Macrobiotic Cannibal) of 1998, in which images of comic book characters and Catholic iconography are juxtaposed with medical illustrations and images of Maya in overcoats and alien spaceships. The piece is a combination woodcut, color lithograph, and chine-colle print. ✭ At the Yale University Art Gallery, New Haven, Connecticut, you'll find "Vida y Drama de Mexico: Prints from the Monroe E. Price and Aimee Brown Price Collection". 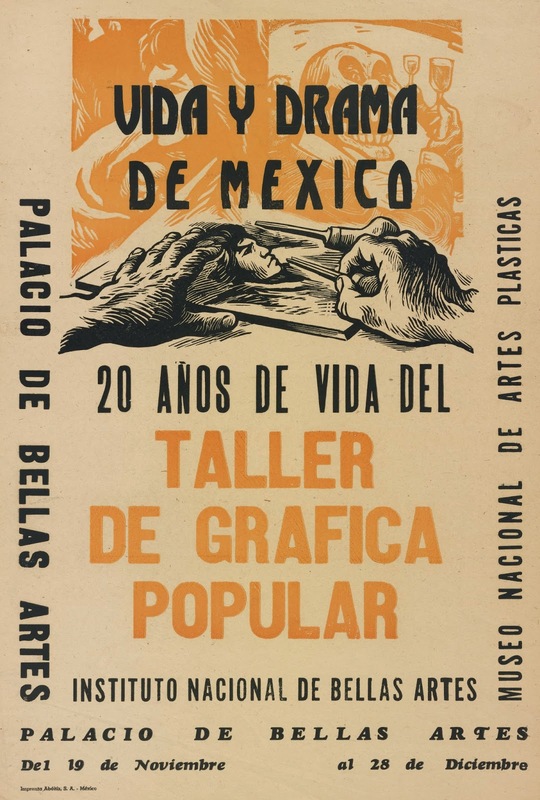 On view through February 1, 2015, the show features approximately 50 Mexican prints and posters from the more than 125 given or lent to the gallery; most come from the Taller de Grafica Popular (People's Graphic Workshop), a Mexico City art collective founded in 1937. In addition to U.S.-Mexican relations, the prints and posters contain anti-war messages, protest messages, images of political heroes and villains, and messages supporting workers' unions. ✭ The exhibition "American Art Brut" opens December 18 at Cavin-Morris Gallery in New York City. Cavin-Morris carries work by emerging and established self-taught, contemporary, and indigenous artists, as well as those who specialize in studio ceramics.